Heat oven to 350°F. Grease bottom only of 13x9-inch pan. In large bowl, mix Bisquick™ mix, carrots, milk, brown sugar, allspice, cinnamon, nutmeg and eggs with wooden spoon until just moistened. Pour batter into pan; spread to edges with spatula. Bake about 40 minutes or until toothpick inserted in centre comes out clean. Place pan on cooling rack. Cool 30 minutes, then poke holes in top of cake with fork or end of wooden spoon. Pour condensed milk evenly over cake, filling holes. Cool completely. In large bowl, beat frosting, whipped cream cheese and whipped topping just until combined. Use spatula to spread topping evenly over cooled cake. 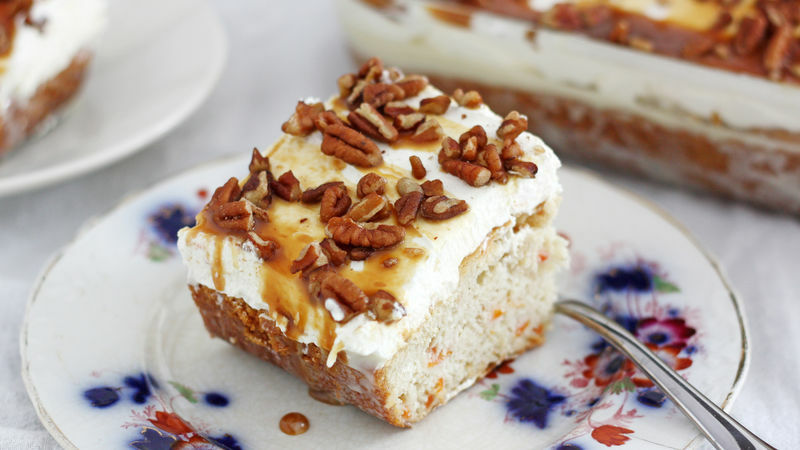 Drizzle evenly with caramel topping; sprinkle with chopped pecans. Cover and refrigerate at least 4 hours to set. Add 1/2 cup raisins or chopped walnuts to cake batter if desired. Be sure to poke the cake at least 25 to 30 times; you want it to soak up all that sweetened condensed milk!